Okra, a vegetable as beautiful and slim like the Lady’s fingers but without the nail paint! Wonder Okra has turned so famous; every cuisine has something to do with Okra. The Slimy and seedy thing, is quite like having growing silk threads with green seed and white beads!! Yes Okra, we shall talk of today. The largest producer of this lady’s Fingers vegetable is my pride, my Country, India. Okra (Abelmoschus esculentus) or ladies finger is important vegetable of the tropical countries and most popular in India. Though, it is virtually not grown in Europe and North America, yet, lot of people in these countries have started liking this vegetable because of good amount of vitamin A and folic acid, besides carbohydrates, phosphorus, magnesium and potassium. There are several Indian Varieties of Okra which have turned popular exports all over the world, especially EU and USA. These different varities of Okra are popularly grown and produced in the above countries. This Agricultural product bears Harmonized System Code as 7099990. The name okra is most often used in the UK, United States and the Philippines, with a variant pronunciation in Caribbean English and Nigeria of okro. The word okra is from the Igbo ọ́kụ̀rụ̀. The plant and its seed pods are also known as “lady’s fingers”.In various Bantu languages, okra is called (ki)ngombo or a variant, and this is possibly the origin of the name “gumbo”, used in parts of the United States and the English-speaking Caribbean (via Portuguese quingombo). In India, it is known by the names vendakkai and bhindi. 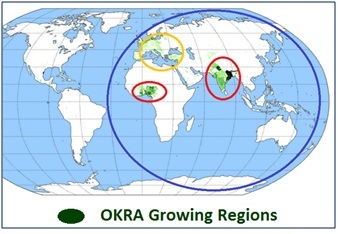 The geographical origin of okra is disputed, with supporters of West African, Ethiopian, and South Asian origins. The plant is cultivated in tropical, subtropical and warm temperate regions of India and Africa mainly. Now it is grown in other countries too. Some of the important varieties of okra are Pusa Makhmali, Pusa Sawani, IIHR 20-31, Punjab Padmini, Arka Anamika, Parbhani Kranti, etc. For export purposes, mostly hybrid varieties are used. A lot of care is taken in growing the Okra in a safe and environmentally-friendly way. Numerous Integrated Pest Management systems are used to ensure minimum usage of chemicals. Both traditional practices and modern know-how are synchronized on the farm. Growing Okra has its own hardships. The crop is prone to damage by various insects, fungi and other insects although there is wide variability in the degree of infestation. It is also subjected to attack of many diseases affecting leaves, flower & fruits. ICAR institutes, state agricultural universities and private seed companies are working on various aspects of genetic improve the plant of okra for develop high yielding and disease-resistant varieties. 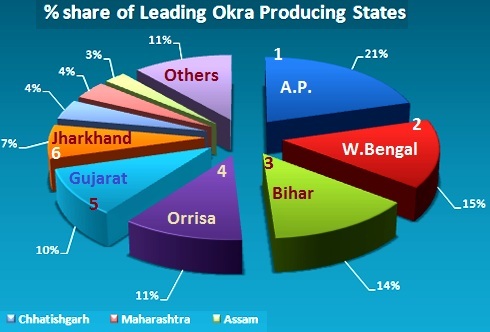 Some of these varieties and hybrids have already made significant improvements in the production and yield of the harvest and has contributed in revolutionizing the production of Okra in India. The plant can be grown throughout the year and resembles cotton in its habit. It is an annual vegetable crop grown in the tropics of the world. 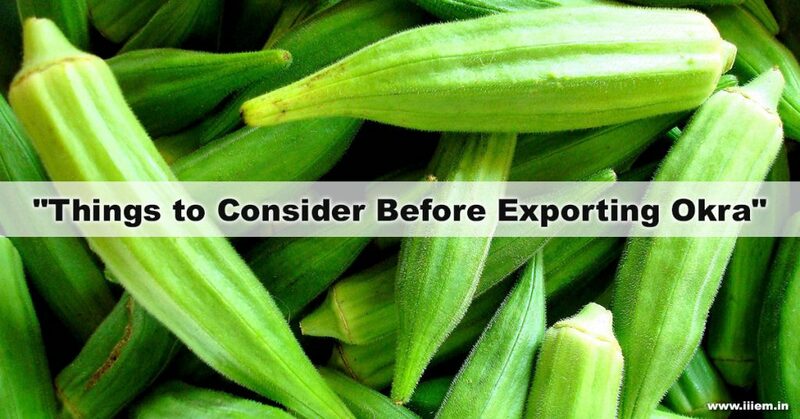 Okra is stored easily and hence it is easy to export. You can store okra in freezer bags (uncut and uncooked only) and store it for later use. It can also be canned. If stored properly, its taste will remain unaffected and feel like it has just come out from the garden. One needs all the important certifications like the BSI, Agmark, FSSAI, BSI, also be members of APEDA & member of respective Chamber of Commerce. Okra is used in multi cuisine across the world, it has medicinal values and is very healthy. 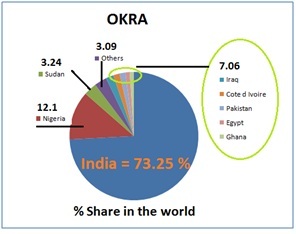 Where shall one export Okra from India? 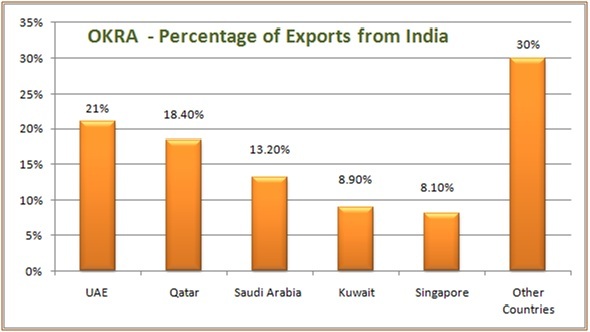 Is there any special program on Export business regarding the same? Search for exporting countries and not the Importing countries for any product. Well here I shall give you a picture which will make your search for market easy. Other Countries means, countries of European Union, UK, USA and some parts of South America too. Remember, your Exports need a proper packaging; lady’s fingers need to be delivered as fresh! The quality parameters of okra namely texture, chlorophyll content, physiological loss in weight, rotting percentage and general appearance are very important. Pods were pre-cooled at 15 ± 1ºC, 90–95% RH; jumble packed in the CFB boxes of 2.0 Kg capacity and then stored at 8 ± 1ºC, 90–95% RH. The pods / fruit harvested should have minimum handling and field packaging will help retain their green color, crisp texture with minimum rotting and physiological loss in weight and good appearance up to 13 days of cold storage. Therefore, in order to maintain high quality of okra from harvesting to the final destination (consumer), the okra pods should be harvested with minimum handling followed by field packaging in CFB boxes. The touch, feel, color and size of okra should be the delight of the buyer on the other side of the world.